In December of 2006 I was Christmas shopping in Tyler. On my way to Best Buy, a big tent in front of the nearby PetSmart full of pups in need of homes got my attention. 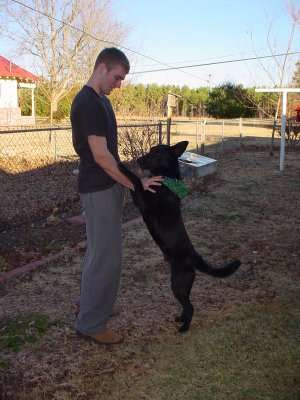 I fell for a jet-black shepherd mix labeled “Sport,” and adopted him on the spot. “Sport” didn’t really suit my boy, and “Scout” didn’t stick either. By the time Christmas rolled around, he was known as Shadow. Shadow turned out to be an amazing big brother to my tiny border collie puppy, Daisy, who joined the family shortly after he did. She would nip at his ears or gnaw on his tail and he would just look at me like, are you really going to let her treat me like this? I’d purchased my first home, out in the sticks, shortly before taking on Shadow and Daisy in rapid succession. That made me a single father of two in the middle of nowhere. All of that was great, except for the single part. The rural setting wasn’t ideal for changing the fact—slim pickin’s. Just a few months after assembling my family of three, an opportunity to relocate to a sales office in Dallas presented itself. I couldn’t pass that up. But a small house on two acres out in Nowhereville cost about as much as the rent for an aging 400 square foot efficiency in the Big D. I couldn’t imagine moving into a space that small with two puppies. I didn’t think the complex would let me keep even one of them at first, so I set out to re-home my babies. Daisy has a redemption story all her own. But in March of 2006 you agreed to take Shadow, and for that I am eternally grateful. Also, thank you for touching base months ago to let me know that he’d recently passed after a long and happy life under your care. I don’t think circumstances could have worked out any better for him.